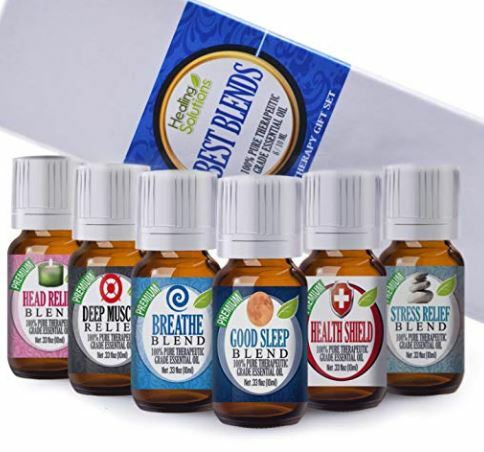 Today only this Healing Solutions Best Blends Essential Oil Set (Set of 6) is on sale for $10.59 Shipped when you clip the $2 off coupon. The Best Blends Top 6 contains the following therapeutic essential oils: Breathe, Good Sleep, Head Relief, Muscle Relief, Stress Relief, and Health Shield – These Oils Compare to Doterra Serenity, PastTense, Deep Blue On Guard and Young Living's Peace & Calming ®, M-Grain ®, PanAway ®. Thieves ® – Consists of Various Oil Blends Including Lavender, Peppermint, Bergamot, Patchouli, Ylang-Ylang, Orange, Tea Tree, Lemon and Four Others.